Oh Trunk Records, what are you like? Hymns A' Swinging is exactly what you'll no doubt already suspect it to be. This is a late-1960s easy-jazz interpretation of various Christian classics, taking in such absurdities as 'All Creatures Great And Small' re-imagined with a frantic samba intro, a swingtime, sexed up reworking of 'He Who Would Valiant Be' and a bossa-beat version of 'O Worship The King'. 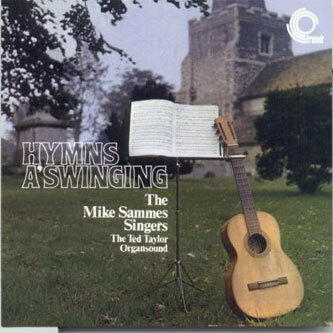 These hymns are all performed between vocal ensemble The Mike Sammes Singers and The Ted Taylor Organsound, an ensemble not only featuring the organ of Ted Taylor (duh), but the flute and tenor sax of Tubby Hayes, plus drums, some very lyrical bass playing and a triple-guitar assault. The recording is rather beautiful, full of period warmth, and the arrangements are ceaselessly playful without ever going so far as to be irreverent. Another fun obscurity from the House Of Trunk.